If you are a procrastinator, this application will do you no good but if you like to make sure a task is done at the right time, read on. This application is available for free but it can go to around $29 per year depending on what you want to do with it. 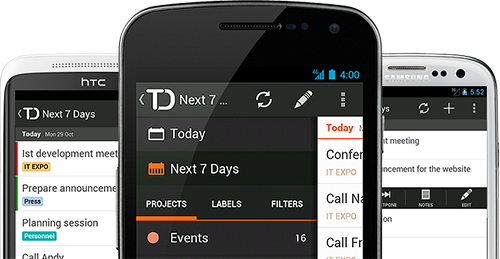 This particular application can keep your to-do list synced with different and several devices. There is a probability that you might not like this application because it is not for every single organized person out there. It is purposely built targeting a few features while others are completely ignored. You can create a project and further add tasks to it. It will allow you to keep adding sub-tasks until you are satisfied so basically you can nest a nest of tasks under a single project. The tasks can be dragged around to fit their priority as per your need. The look is very minimalistic (the simple the better). While the project is mentioned on the left side, the tasks are mentioned on the right with an arrow to hide or unhide the sub-tasks. You have many different settings for the tasks you set for example, deadlines, labels, editing options, addition of another task and color-coded labels. The application also has plug-ins for browsers such as Firefox and Chrome so you’re always reminded of what you have to do and where your focus should be at a particular point in time. You can even sync the data with Outlook. If you are using this application on a web-browser you will definitely need internet, but if you have a mobile version of the same application, you can work offline which is a huge plus. If you are a free user, you will not be able to add any notes to the tasks, see completed tasks and filter them out, or integrate deadlines with iCal. Premium application which costs $29 (not a lot) will allow you to use these features. If you are a person who is extremely organized, you should give this application a shot. But should you pay for the application or go for the free ones. There are many people around who would be able to survive without the additional features offered in the premium version of the application, but then there are some who would want additional offers just to exploit the full benefits of the applications. Just remember though, what you are looking for from a to-do application, is easily provided to you with the free version as well.